5% discount on all prices when payment is received in gold or silver coins. Click here to order. Shipping within the U.S. is FREE on any order of at least $65, and included with every essential oil order are several pdf ebooks on how to best use them. Please inquire about availability of smaller bottle sizes and prices on the more expensive oils. Past cultures valued few substances above nature’s essential oils. For at least the last 6,000 years, they have been used not only for their scents and as beauty care products, but also for their medicinal and curative properties. Those who are wise to essential oils have always considered them sacred. According to the translation of ancient Egyptian Hieroglyphics and Chinese Manuscripts, priests and physicians were using essential oils thousands of years before the time of Christ. They are mankind's first medicine. There are 188 references to essential oils in the Bible. When the pharaoh Tutankhamun’s tomb was opened in 1922, the air was permeated with their aroma. Essential oils were very highly esteemed trade items and at places and times were even used as money. Our modern society is just beginning to catch on to them. Like gold & silver, they are real; not like pieces of paper that only represent something else. Very few of the world’s plants produce essential oils - there are less than a couple hundred aromatic essences that can be extracted from the flowers, trees, fruits, bark, grasses and/or seeds from various plants, and all of these oils have distinctive therapeutic, psychological and physiological properties that improve health and prevent illness. All 3wisemenessentials essential oils are premium, therapeutic quality oils. They are free of any pesticides or chemical residues and all are 100% pure and undiluted. They are harvested and distilled in clean facilities by knowledgeable and caring people. Additionally, they have been gas chromatographically tested to ensure their purity and natural source. 003 Anise Seed essential oil $11/oz. Traditional Use: It is used in pipe tobacco, as well as in a popular alcoholic drink in Turkey called ‘raki’, which is made from the seed. Properties: Antiseptic, antispasmodic, carminative, diuretic, emmenagogue, expectorant, galactagogue, stimulant, and stomachic. Blends Well With: Lavender, orange, other spice oils, pine, and rose. Safety Data: Use in moderation only. Can cause dermatitis, acts as a narcotic and slows down the circulation in large quantities, which can lead to cerebral disorders. Not to be used while pregnant. 005 Bergamot essential oil $29/oz. Bergamot (Citrus aur. bergamia) is a mutation of the sour orange and not a hybrid. In 1600, French perfumers started using Bergamot to enliven fragrances, particularly eau de cologne. It is foremost traditionally considered a miraculous neuro-tonic and a powerful helper against depression caused by fatigue or unreleased tensions and frustrations. Traditional Use: The oil has been used in Italian folk medicine for many years, primarily for fever (including malaria) and worms. It is used to impart a delightful flavor and distinctive aroma to Earl Grey tea. Properties: Analgesic, anthelmintic, antidepressant, antiseptic, antispasmodic, antitoxic, astringent, carminative, cicatrisant, deodorant, digestive, diuretic, expectorant, febrifuge, laxative, parasiticide, rubefacient, sedative, stimulant, stomachic, tonic, vermifuge, and vulnerary. Benefits: Abscess (cold), acne, anxiety, boils, bronchitis, cancer (uterine), carbuncles, cold sores, colds, colic, cystitis, depression, diphtheria, dyspepsia, eczema, fevers, flatulence, flu, gall stones, glossitis, gonorrhea, halitosis, herpes, infections, insect repellant and insect bites, intestinal parasites, leucorrhoea, loss of appetite, nervous tension, oily complexion, psoriasis, respiratory tract infections, sore throat, thrush, vaginal pruitis, and varicose veins. Blends Well With: Almost all essential oils, including: black pepper, chamomile, clary sage, coriander, cypress, frankincense, geranium, helichrysum, jasmine, juniper, lavender, lemon, mandarin, melissa, neroli, nutmeg, orange, rosemary, sandalwood, vetiver, violet, ylang ylang. Safety Data: Avoid in cases of liver problems. Not for use when pregnant or nursing. Possible skin irritant - dilute well. If not specified bergapten-free it may cause photosensitivity (our Bergamot offered is Bergapten free). 006 Black Pepper essential oil $29/oz. Black pepper (Piper nigrum) essential oil is extracted from dried, fully grown yet unripe fruit of the pepper plant - a perennial woody vine with heart shaped leaves and small white flowers. It has been used since antiquity in the culinary and healing arts. Indian monks ate black pepper daily to sustain their endurance and increase their energy. During the spice wars it was a trading commodity. The oil is well used in aromatherapy formulas and in perfumery. It is commonly added to massage blends to enhance circulation. It also adds a lovely 'spicy' note to aromatic and perfume blends. Traditional Use: Used in the East for over 4,000 years for medicinal and culinary purposes. Known to have been used in Chinese medicine, and by the ancient Greeks. In Greece it is used for intermittent fever and to fortify the stomach. Properties: Analgesic, anticatarrhal, antimicrobial, antiseptic, antispasmodic, anti-toxic, aperitif, aphrodisiac, bactericidal, carminative, diaphoretic, digestive, diuretic, expectorant, febrifuge, laxative, rubefacient, stimulant, stomachic, tonic (especially of the spleen). Benefits: Anaemia, arthritis, catarrh, cellulite, chilblains, chills, cholera, cold, colic, constipation, cough, diarrhea, dysentery, dyspepsia, dysuria, encourages bravery and courage, fevers, flatulence, heartburn, helps resolve past emotional issues, increases alertness and improves concentration, influenza, loss of appetite, muscular aches and pains, nausea, neuralgia, poor circulation and muscle tone, quinsy, rheumatic pain, sprains, stiffness, toothache, vertigo, and vomiting. Blends Well With: Basil, bergamot, clary sage, clove, coriander, eucalyptus, fennel, frankincense, geranium, ginger, grapefruit, lavender, juniper, lemon, lemongrass, lime, mandarin, marjoram, myrrh, orange, nutmeg, patchouli, palmarosa, rose, rosemary, sage, sandalwood, spikenard, tea tree, valerian, vetiver, and ylang ylang. Safety Data: Non-toxic, non-sensitizing, irritant in high concentration due to rubefacient properties. Use in moderation only. 009 Carrot Seed essential oil $27/oz. Carrot Seed essential oil (Daucus carota) is steam distilled from the seeds of Wild Carrot - aka Queen Anne's Lace - considered by many who don’t know otherwise to be a 'common roadside weed'. The oil has a unique woody, mildly sweet aroma, and a light, fluid consistency, and lends itself therapeutic use as well as natural perfumery. Carrot See is a premier skin care oil. In the Chinese tradition, it is used to treat dysentery and to expel worms. Traditional Use: Used in flavoring liquors and in perfume compositions. Properties: Anthelminthic, antiseptic, carminative, depurative, diuretic, emmenagogue, hepatic, stimulant, tonic, and vasodilatory. Benefits: Accumulation of toxins, amenorrhea, anemia, anorexia, arthritis, colic, dermatitis, dysmenorrhea, eczema, edema, glandular problems, gout, indigestion, liver congestion, mature skin, psoriasis, rashes, reduces wrinkles, regulates the thyroid, rheumatism, and skin irritation. Blends Well With: Bergamot, cardamom, cassie, cedarwood, citrus oils, frankincense, geranium, mimosa, sandalwood and spice oils. Safety Data: Do not use during pregnancy as it can cause abortions. Non-toxic, non-irritant, non-sensitizing. 010 Cedarwood essential oil $14/oz. Cedarwood (Cedrus atlantica) was the first known oil to have been extracted. Noah burned cedarwood incense in thanks for surviving the flood. Tibetans burn cedarwood incense in the temples. Other ancient cultures used cedarwood for sarcophagi and palace and temple building material. This ancient oil was used extensively by the Egyptians in daily beauty rituals. It is one of the basic therapeutic use essential oils employed today. Traditional Use: Famed cedars of Biblical times (Lebanon cedar) provided one of the world’s earliest perfumes. Used by the ancient Egyptians for mummification. Properties: Antifungal, antiputrescent, antiseborrheic, antiseptic, aphrodisiac, astringent, diuretic, expectorant, insecticide, mucolytic, regenerative, sedative, stimulant (circulatory), and tonic. Blends Well With: Bay, bergamot, calamus, cardamom, cassie, roman chamomile, clary sage, costus, cypress, eucalyptus (all), frankincense, geranium, ginger, grapefruit, jasmine, juniper, labdanum, lavender, marjoram, mimosa, neroli, olibanum, orange, palmarosa, patchouli, petitgrain, rosemary, rosewood, sandalwood, vetiver, and ylang ylang. Safety Data: Be aware of which Cedar you are using. Make sure that you are using Cedrus (Cedarwood Atlas), not Juniperus or Thuja. Use in low dilutions (1%), may sensitize skin, and avoid during pregnancy. Those with elevated blood pressure should avoid cedarwood. 011 Roman Chamomile essential oil $83/oz. Roman Chamomile (Anthemis nobilis) has had a medicinal reputation in the Mediterranean region for over 2000 years, and is still in widespread use. In ancient Egypt and early Scandinavian culture chamomile was associated with the sun god, and it was also held to be the “plants’ physician”, since it promoted the health of plants nearby. It has one of the highest contents of esters of any known essential oil. Even in very small concentrations, whether alone or in combination with other oils, Roman Chamomile essential oil has a soothing, calming effect. It helps relieves cramps, spasms, and can assist in mild shock. Largest Producing Countries: USA, Britain, Belgium, Hungary, Italy, France. Traditional Use: Extensively used in cosmetics, soaps, detergents, high-class perfumes and hair and bath products. Properties: Analgesic, anti-anemic, antibiotic, antidepressant anti-inflammatory, antineuralgic, antiphlogistic, antiseptic, antispasmodic, bactericidal, calmative, carminative, cholagogue, cicatrizant, digestive, emmenagogue, febrifuge, hepatic, hypnotic, immunostimulant, nerve sedative, stomachic, sudorific, tonic, vermifuge, and vulnerary. Benefits: Acne, arthritis, boils, burns, chilblains, colic, cuts, dermatitis, dysmenorrhea, dyspepsia, earache, eczema, fevers, hair care, headache, indigestion, inflammations, insect bites, insomnia, menopausal problems, menorrhagia, migraine, muscular pain, nausea, nervous tension, neuralgia, pain relief, rashes, rheumatism, sensitive skin, skin allergies, sprains, stress related complaints, teething pain, toothache, and wounds. Blends Well With: Bergamot, clary sage, eucalyptus, geranium, grapefruit, jasmine, labdanum, lavender, lemon, mandarin, neroli, oakmoss, palmarosa, patchouli, rose otto, sandalwood, tea tree.and ylang ylang. Safety Data: Non-toxic and non-irritant. Occasionally, contact dermatitis has occurred with this oil and those who are allergic to the Ragweed family should probably not use it. 013 Citronella essential oil $11/oz. Citronella is commonly known for it's natural insect repellent properties, though it has many other uses in aromatherapy. The oil is steam distilled from a tall, aromatic, perennial grass originally native to Sri Lanka. This oil is the known as Java citronella, and has a fresh, powerful, lemon-like scent. It is higher in Citronellal and Citronellol than the Ceylon/nardus variety. Uplifting and refreshing its aroma is good at scaring away cold, flu and fatigue. Traditional Use: Extensively used in soaps, detergents, household goods and industrial perfumes. Employed in insect repellent formulations against moths, ants, fleas, for use in the home and in the garden. Properties: Antiseptic, antispasmodic, bactericidal, deodorant, diaphoretic, diuretic, emmenagogue, febrifuge, fungicidal, insecticide, stomachic, tonic, and vermifuge. Benefits: Colds, excessive perspiration, fatigue, flu, hair oil, headaches, heart stimulant, insect repellant, migraine, minor infections, neuralgia, and oily skin. Blends Well With: Bergamot, cedarwood, geranium, lavender, lemon, orange, and peppermint, pine. Safety Data: Non-toxic, non-irritant; may cause dermatitis in some individuals. Avoid during pregnancy. Traditional Use: In Chinese medicine the oil is used for diarrhea, hernia, bad breath and bronchitis. Used in dental preparations, and as a fragrance component in toothpastes, soaps, toiletries, cosmetics and perfumes, the production of printing ink, glue and varnish. Properties: Analgesic, anthelminthic, antibiotic, anti-emetic, antifungal, antihistaminic, anti-infectious, antineuralgic, anti-oxidant, antirheumatic, antiseptic, antiviral, aphrodisiacal, carminative, counter-irritant, expectorant, general stimulant, larvicidal, parasiticide, spasmolytic, stimulant, stomachic, tonic, and vermifuge. Blends Well With: Allspice, basil, bay, bergamot, black pepper, roman chamomile, clary sage, geranium, ginger, grapefruit, jasmine, lavender, lemon, lime, mandarin, neroli, nutmeg, orange, palmarosa, rose, rosemary, sandalwood, vanilla, and ylang ylang. Safety Data: Only the bud oil, and not the leaf or stem oil should be used. May cause skin irritation on sensitive skin. Avoid during pregnancy. Do not use on children under 12 years or in baths. Use in moderation only in low dilution (less than 1%). 016 Coriander Seed essential oil $15/oz. Coriander (Coriandrum sativum) has been a popular aromatic stimulant and culinary spice cultivated for over 3,000 years. It is mentioned in all medieval medical texts, by the Greeks, in the Bible, and by early Sanskrit writers. Indigenous to the Holy land, Coriander was compared by the Ancient Hebrews to the manna provided by God to the Children of Israel and was one of the bitter herbs eaten during Passover. The Ancient Egyptians believed it to the 'secret to happiness' and combined it with fresh garlic in wine to be drunk as an aphrodisiac. In fact, it is used today in flavoring liqueurs such as Chartreuse and Benedictine. Traditional Use: Used as a flavoring agent in pharmaceutical preparations, especially digestive remedies. Properties: Analgesic, antibacterial, anti-depressive, anti-infectious, anti-oxidant, anti-rheumatic, antispasmodic, aperitif, aphrodisiac, bactericidal, depurative, digestive, carminative, cytotoxic, fungicidal, larvicidal, lipolytic, neurotonic, revitalizing, sedative, stimulant (cardiac, circulatory, nervous system), stomachic, and tonic. Blends Well With: Bergamot, black pepper, cardamom, cinnamon, citronella, clary sage, clove, cypress, frankincense, geranium, ginger, grapefruit, jasmine, lemon, neroli, nutmeg, olibanum, orange, palmarosa, petitgrain, pine, ravensara, sandalwood, vetiver, and ylang ylang. Safety Data: Dilute before using externally. Generally non-toxic, non-irritant, and non-sensitizing. Stupefying in large doses – use in moderation. Cross sensitivity reported with fennel and anise; considered a known allergen, avoid with fibrosis (breast cancer). 018 Dill Seed essential oil $16/oz. Traditional Use: Used extensively in alcoholic, soft drinks and foodstuffs, especially pickles and condiments. Properties: Amenorrhea, antispasmodic, bactericidal, carminative, digestive, emmenagogue, galactagogue, hypotensive, stimulant, and stomachic. Benefits: Colic, dyspepsia, flatulence, indigestion, lack of a menstrual cycle, and promotes milk flow in nursing mothers. Blends Well With: Caraway, elemi, mints, nutmeg, spice and citrus oils. Safety Data: Non-toxic, non-irritant, and non-sensitizing. Its use while pregnant is not recommended. Traditional Use: Typically used in the preparation of liniments, inhalants, cough syrups, ointments, toothpaste, and as pharmaceutical flavoring. Properties: Analgesic, antibiotic, antifungal, anti-infectious, anti-neuralgic, antiparasitic, antiputrescent, antirheumatic, antiseptic, antispasmodic, antiviral, balsamic, cicatrizant, decongestant, deodorant, depurative, diuretic, expectorant, febrifuge, hypoglycemic, pectoral, prophylactic, rubefacient, stimulant, vermifuge, and vulnerary. Blends Well With: Cedarwood, chamomile german, chamomile roman, cypress, geranium, ginger, grapefruit, juniper, lavender, lemon, marjoram, peppermint, pine, rosemary, thyme linalool, and thyme red. Safety Data: Not to be used on children under 12 years. Not compatible with homeopathic treatment. Non-irritant, non-toxic, non-sensitizing, however its use while pregnant is not recommended. Traditional Use: In pharmaceutical products it is used in cough drops, lozenges, carminative and laxative preparations. In the food industry it is utilized in all of the major food categories, as well as soft drinks and alcoholic drinks. The cosmetic industry adds fennel to soaps, toiletries and perfumes, and room sprays. Properties: Antibiotic, anti-inflammatory, antimicrobial, antiseptic, antispasmodic, aperitif, carminative, depurative, diuretic, emmenagogue, estrogen-like, expectorant, galactagogue, laxative, orexigenic, regenerative, splenic, stimulant (circulatory), stomachic, tonic, and vermifuge. Benefits: Abdominal pains or cramps, amenorrhea, anorexia, antidote for poisonous mushrooms, asthma, bronchitis, bruises, calms, cellulitis, child birthing (inhaled), colic, constipation, coughs, digestive problems, dull complexion, dyspepsia, edema, fertility, flatulence, fluid retention, hiccough, improves memory, insufficient milk (nursing mothers), liver problems, mature skin, menopausal problems, nausea, obesity, oily skin, PMS, pyorrhea, rheumatism, and sore throats. Safety Data: Non-irritant, relatively non-toxic, narcotic in large doses. It should not be used on epileptics, during pregnancy, those with endometriosis, or estrogen-dependent cancer. Use only in moderation. 022 Frankincense essential oil $56/oz. Frankincense (Boswellia carterii) is one of the 'holy' oils from ancient times when it was considered more valuable than gold. It been used for 5000 years for spiritual healing and was used in ancient Egypt in the embalming process. Frankincense symbolizes divinity. Upon first glance, the frankincense tree may seem rather unremarkable. It appears as a giant shrub, with many knurled branches topped with abundant slender leaves and sometimes, small white flowers. Native to northern Africa, it looks like it belongs in the desert, growing in some of the world's harshest conditions. It is the sap of the that has such profound lore surrounding it. When the tree's bark is pierced with a knife (known traditionally as a 'mingaf'), a milky-white oleoresin is exuded - thought the tree is not harmed (myrrh is harvested this way as well). The resin forms droplets known as 'tears' or 'pearls', which harden into the orangish, brownish gum known as Frankincense. It has a powerful and enticing wood aroma that sweetly sparkles with freshness and spice. Frankincense maintains its integrity in any blend. 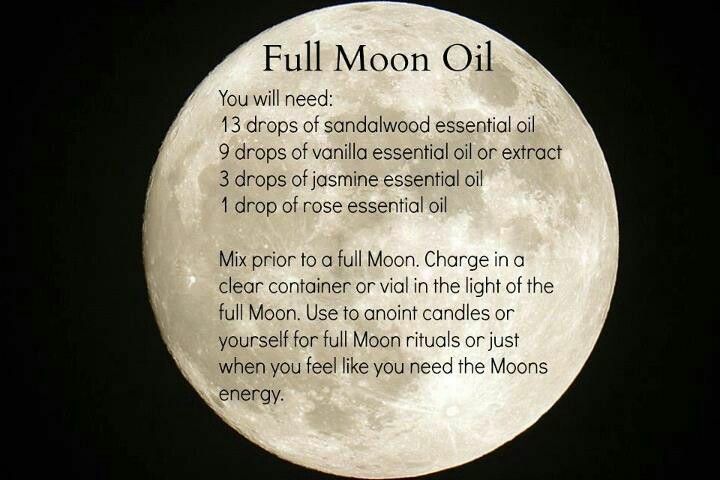 It is an excellent oil for grief and is probably best known for its enduring emotional and spiritual support. Often used in religious ceremonies Frankincense makes a wonderful anointing oil as it is thought to possess powers to heal almost every conceivable malady. It is the quintessential oil for letting go and enhancing meditation practice, having the power to uplift human awareness to a higher level by freeing the nerves from excessive tension, allowing us to focus on the underlying transcendental unity of our inner Self. Traditional Use: The gum and oil are used as fixatives and fragrance components in soaps, cosmetics, and perfumes, especially oriental, spice and men’s fragrances. Because frankincense has the ability to slow down and deepen the breath it has been used for thousands of years in ceremonial incense for meditation and prayer. Properties: Antibacterial, antidepressant, anti-inflammatory, antiseptic, astringent, balsamic, carminative, cicatrizant, cytophylactic, digestive, diuretic, emmenagogue, expectorant, immunostimulant, pectoral, revitalizer, sedative, stimulant, tonic, uterine, and vulnerary. Blends Well With: Basil, bergamot, black pepper, camphor, cedarwood, cinnamon, clary sage, coriander, cypress, geranium, grapefruit, lavender, lemon, mandarin, mimosa, myrrh, neroli, orange, palmarosa, patchouli, pine, rose, sandalwood, vetiver, ylang ylang, and other spices. 023 Geranium essential oil $32/oz. During the 1600’s, Dutch sailors transported geraniums to Europe from Africa, which gardeners then planted to help ensure that no evil spirits would enter their homes. The Colonial Americans used geranium leaves to line baking pans to impart a delicate rose flavor to their cakes. There are approximately 700 varieties of geranium, only about 10 of which supply essential oil. Harvesting just as the leaves turn yellow captures the unique rose-like aroma; previous to this, the aroma is lemonier. Traditional Use: Used as a fragrance component in all kinds of cosmetic products: soaps, creams, and perfumes. It is also is employed as a flavoring agent in most major food categories, alcoholic and soft drinks. Properties: Analgesic, antibacterial, antibiotic, antidepressant, antihemorrhagic, anti-infectious, anti-inflammatory, antioxidant, antiseptic, antispasmodic, astringent, cicatrizant, deodorant, diuretic, fungicidal, haemostatic, regenerative, sedative, stimulant of the adrenal cortex, styptic, tonic, vermifuge, and vulnerary. Blends Well With: Basil, bergamot, black pepper, chamomile roman, clary sage, clove, cypress, fennel, frankincense, ginger, grapefruit, jasmine, juniper, lavender, lemon, mandarin, neroli, orange, palmarosa, patchouli, peppermint, rose, rosemary, sandalwood, and ylang ylang. Safety Data: Non-toxic, non-irritant, generally non-sensitizing; possible contact dermatitis in hypersensitive individuals, especially with the Bourbon type. 024 Ginger essential oil $43/oz. Ginger (Zingiber officinale) was one of the first products to travel the “spice route” from Asia to Europe, where both the Greeks and Romans made extensive use of it. Romans took advantage of its aphrodisiac powers and added it to wine, while Hawaiians scented their clothing. In Senegal, West Africa, the women make belts with the rhizome, in the hope of arousing their partner’s sexual interest. Ginger essential oil may be added to almost any massage blend and it is noted to assist other essential oils in reaching their target organs. Traditional Use: It is used in digestive, carminative and laxative preparations; used as a fragrance component in cosmetics and perfumes, especially oriental and men’s fragrances. Properties: Analgesic, antibacterial, antioxidant, antiseptic, antispasmodic, antitussive, aperitif, aphrodisiac, appetite stimulant, carminative, cephalic, diaphoretic, expectorant, febrifuge, laxative, rubefacient, stimulant, stomachic, and tonic. Benefits: Arthritis, bruises, catarrh, chills, colds, colic, congestion, coughs, cramp, debility, diarrhea, fatigue, fever, flatulence, flu, fractures, improves memory, indigestion, infectious disease, loss of appetite, muscular aches and pains, nausea, nervous exhaustion, poor circulation, promotes courage, rheumatism, seasickness, sexual tonic, sharpens senses, sinusitis, sore throat, sprains, and travel sickness. Blends Well With: Bergamot, blackpepper, cedarwood, clove, coriander, eucalyptus (all), frankincense, geranium, grapefruit, jasmine, juniper, lemon, lime, mandarin, neroli, nutmeg, orange, palmarosa, patchouli, peppermint, rose, rosemary, rosewood, sandalwood, tea tree, vetiver, and ylang ylang. Safety Data: Non-toxic, non-irritant (except in high concentration), slightly phototoxic. May sensitize skin; use low dilution’s (1%). Avoid on face, neck, babies, and children. 025 Grapefruit essential oil $22/oz. Traditional Use: Employed as a fragrance component in soaps, detergents, cosmetics and perfumes. Extensively used in deserts, soft drinks and alcoholic beverages. Properties: Antidepressant, anti-infectious, antiseptic, antitoxic, astringent, bactericidal, depurative, digestive, diuretic, restorative, stimulant (lymphatic, digestive), and tonic. Blends Well With: Basil, bergamot, black pepper, cardamom, cedarwood, citronella, clary sage, clove, cypress, eucalyptus (all), fennel, frankincense, geranium, ginger, juniper, lavender, lemon, lime, mandarin, neroli, orange, palmarosa, patchouli, peppermint, rosemary, thyme linalool, and ylang ylang. Safety Data: Non-toxic, non-irritant, and relatively non-sensitizing. Some cases of skin irritation have been reported so use with caution. Not to be used while pregnant. The generic name helichrysum derives from the Greek helios (sun) and chrysos (gold), as the flower heads resemble little golden suns. There are about 500 species of helichrysum, of which only a few produce essential oil for distillation. The two varieties considered the best for therapeutic use are Helichrysum italica and Helichrysum angustifolium. The shrubby plants are almost identical, except in size, the former growing to a height of 60cm and the Italian variety reaching just 30cm. Along with frankincense, myrrh, spikenard, and rose, helichrysum is ranked with the most ancient and valuable healing substances in the world. Helichrysum is one of the most important essential oils in aromatherapy because of its profound and wideranging healing properties, and because it works well in combination with many other essential oils; enabling the other oils to be even more effective than they would be by themselves. Helichrysum is more anti-inflammatory than German Chamomile, more tissue regenerating than Lavender, more cicatrisant (helping the formation of scar tissue and preventing scarring) than Frankincense. It heals physical and emotional scarring, opens the heart, connects body and spirit, and opens human beings to spiritual life. Helichrysum oil is also known as Everlasting Oil or Immortelle. The essential oil of helichrysum is captured by steam distillation of the flowering tops. The yield is very low relative to other essential oil plants and this of course is reflected in a relatively high value and price. Traditional Use: Used as a fixative in soaps, cosmetics, and perfumes. Properties: Analgesic, anti-allergenic, anticoagulant, anti-inflammatory, antimicrobial, antiseptic, antispasmodic, antitussive, astringent, cholagogue, cicatrizant, diuretic, expectorant, fungicidal, hepatic, nervine, and stimulant. Blends Well With: Bergamot, black pepper, cedarwood, chamomile german, clary sage, clove, cypress, eucalyptus citriodora, frankincense, geranium, grapefruit, juniper, labdanum, lavender, lemon, lime, mandarin, mimosa, neroli, niaouli, oakmoss, orange, oregano, palmarosa, pine, ravensara, rose, rosemary, sage, tea tree, thyme linalol, vetiver, and ylang ylang. Recipe: Make a massage oil for sprains, strains, aching muscles and arthritic joints. Mix two drops each of helichrysum, lavender and clary-sage essential oils in two tablespoons of sweet almond oil. Massage into affected areas. Safety Data: Non-toxic, non-irritant, and non-sensitizing. Helichrysum oil should not be used by children younger than 12 or by pregnant women. Also, helichrysum can evoke powerful emotions in some individual and should therefore be used in moderation. 030 Jasmine Sambac Absolute $222/oz. Jasmine is the most masculine of all the floral oils, and since ancient times, it has been referred to as the King of oils (Rose is the Queen). An absolute is extracted from Jasmine flowers, as they are considered too delicate to process through steam distillation. The advantage of the absolute is that the complete aroma of this wonderful flower is preserved in the resultant oil. Jasmine sambac is most highly valued in aromatherapy for its euphoric, sensual qualities. In India, jasmine is associated with the Hindu god of love, Kama, who, like the Greek Eros and the Roman Cupid, is represented with a bow, which has arrows tipped with jasmine blossoms, in order to pierce the heart with desire. Along with hyacinth and rose, it also made a frequent appearance in Sufi poetry as a symbol of love and spiritual longing. For centuries, women have treasured it for its seductive, beautiful fragrance. It takes 1,000 lbs. of carefully hand-picked blossoms to produce one pound of Jasmine Absolute precious oil. Jasmine’s flowers open at twilight releasing its intriguing floral bouquet. The blossoms are collected before sunrise, and handled with care to preserve their delicate scent. Description: Jasmine Sambac is a beautiful plant; its flowers bloom late in the evening unlike Jasmine Grandiflorum that blooms in the early dawn. Common Uses: Jasmine Sambac is well regarded as an aphrodisiac, though it is also considered an antidepressant, sedative, and antispasmodic. Used extensively in soaps, toiletries, cosmetics, and perfumes, especially high-class floral and oriental fragrances. Properties: Analgesic (mild), antidepressant, anti-inflammatory, antiseptic, antispasmodic, aphrodisiac, carminative, cicatrisant, expectorant, galactagogue, parturient, sedative, and tonic (especially uterine). Blends well with: Jasmine Sambac generally works with all oils. It helps to round out scents, and tends to work particularly well with other aphrodisiac oils (sandalwood and ylang ylang are two great examples). Aromatic Description: Jasmine Sambac is an incredibly intense aroma that is very floral, yet more musky and masculine than Jasmine Grandiflorum. Safety Data: Non-toxic, non-irritant, generally non-sensitizing (an allergic reaction has been known to occur in some individuals) For perfume use only and not to be ingested. Its use while pregnant is not recommended. 032 Lavender, Extra essential oil $19/oz. The name “lavender” is derived from the Latin lavare, meaning, “to wash”. Known as one of the seven polyvalents (effective against many toxins), which are applicable to many ailments. Greeks and Romans perfumed their bathwater with lavender, burned lavender incense to appease their wrathful gods, and believed the scent of lavender to be soothing even to untamed lions and tigers. It was in the middle of the last century that the term 'Aromatherapy' was coined by French cosmetic chemist Rene-Maurice Gattefosse - Dr. Gattefosse discovered the healing properties of Lavender oil when, after burning his hands in a laboratory accident, he submersed them in the flower's essential oil. His amazingly speedy recovery prompted him to write his book 'Aromatherapy' in 1937. Traditional Use: Used in pharmaceutical antiseptic, ointments, burn salves, and as a fragrance. Extensively employed in all types of soaps, lotions, perfumes, etc. Properties: Analgesic, anticonvulsive, antidepressant, anti-inflammatory, antimicrobial, antirheumatic, antiseptic, antispasmodic, antitoxic, antitussive, antivenomus, carminative, cholagogue, choleretic, cicatrisant, cordial, cytophylactic, decongestant, deodorant, diuretic, emmenagogue, hypotenser, insecticide, nervine, parasiticide, rubefacient, sedative, splenetic, stimulant, sudorific, tonic, vermifuge, and vulnerary. Blends Well With: Bergamot, black pepper, cedarwood, german and roman chamomile, clary sage, clove, cypress, eucalyptus, geranium, grapefruit, juniper, labdanum, lemon, lemongrass, mandarin, marjoram, oakmoss, orange, palmarosa, patchouli, peppermint, pine, ravensara, rose, rosemary, tea tree, thyme linalol, and vetiver. 033 Lemon essential oil $11/oz. Known as one of the seven polyvalents (effective against many toxins), which are applicable to many ailments. Its reputation grew when the British Navy issued large quantities of the fruit to counteract the onslaught of scurvy and other vitamin-deficiency problems on lengthy sea voyages. Used diffused in the atmosphere in banks and other commercial buildings in Japan to reduce worker error. In many European countries, the oil is considered somewhat of a 'cure all', particularly with infectious illness. Lemon also serves well as an insect repellent, alone or in blends. Traditional Use: Used as a flavoring agent in pharmaceuticals. Extensively used as a fragrance component in soaps, detergents, cosmetics, toilet waters and perfumes. Employed by the food industry in most types of product, including alcoholic and soft drinks. Properties: Anti-anemic, antibiotic, antidepressant, antimicrobial, antirheumatic, antisclerotic, antiscorbutic, antiseptic, antispasmodic, antitoxic, astringent, bactericidal, calmative, carminative, cicatrisant, depurative, diaphoretic, digestive, diuretic, febrifuge, haemostatic, hypotensive, immunostimulant, insecticidal, rubefacient, sedative, stimulant, tonic, and vermifuge. Blends Well With: Benzoin, chamomile, citronella, elemi, eucalyptus, fennel, frankincense, geranium, juniper, labdanum, lavender, lime, neroli, oakmoss, olibanum, orange, peppermint, rose, sandalwood, ylang ylang, and other citrus oils. 034 Lemon Grass essential oil $16/oz. Traditional Use: Extensively used as a fragrance component in soaps, detergents, cosmetics and perfumes. Also used for the isolation of citral and for the adulteration of more costly oils such as verbena or melissa. Properties: Analgesic, antidepressant, antifungal, anti-inflammatory, antimicrobial, antioxidant, antiparasitic, antipyretic, antiseptic, antiviral, astringent, bactericidal, carminative, deodorant, depurative, digestive, febrifuge, fungicidal, galactagogue, insecticidal, nervine, sedative, tonic, and vasodilator. Blends Well With: Basil, bergamot, black pepper, cedarwood, clary sage, coriander, cypress, eucalyptus, fennel, geranium, ginger, grapefruit, lavender, lemon, marjoram, orange, palmarosa, patchouli, rosemary, tea tree, thyme linalol, vetiver, and ylang ylang. Safety Data: Must be diluted. Non-toxic, but possible dermal irritation and/or sensitization may occur in some individuals, use with care. Its use while pregnant is not recommended. 035 Lime essential oil $13/oz. Traditional Use: Used as a fragrance component in soaps, detergents, cosmetics, and perfumes. Properties: Antirheumatic, antiscorbutic, antiseptic, antispasmodic, antiviral, aperitif, astringent, bactericidal, deodorant, febrifuge, restorative, and tonic. Benefits: Acne, anemia, arthritis, asthma, boils, brittle nails, bronchitis, catarrh, cellulitis, chilblains, colds, corns, cuts, dyspepsia, fever and infections, flu, greasy skin, herpes, high blood pressure, insect bites, liver pain, mouth ulcers, nosebleeds, obesity (congestion), poor circulation, rheumatism, stomach cramps, throat infections, varicose veins, and warts. Lime is especially good for internal parasites. Blends Well With: Citronella, clary sage, geranium, grapefruit, lavandin, lavender, lemon, neroli, nutmeg, orange, rose, rosemary, tonka bean, vanilla, vetiver, ylang ylang, and other citrus oils. Safety Data: Should not be used on skin prior to exposure to the sun or tanning lights. Non-toxic, non-irritant, and non-sensitizing. Its use while pregnant is not recommended. 036 Litsea Cubeba essential oil $11/oz. Traditional Use: Used as a fragrance component in air fresheners, soaps, deodorant, colognes, toiletries, and perfumes. Properties: Antibiotic, antidepressant, anti-infectious, anti-inflammatory, antiseptic, deodorant, insecticidal, sedative, stimulant, stomachic, and vulnerary. Benefits: Acne, anxiety, arrhythmia, cellulite, dermatitis, epidemics, excessive perspiration, flatulence, gastric ulcers, general tonic, high blood pressure, indigestion, insect repellant, nervous depression, oily skin, poor appetite, relaxing, sanitation, stress, and tissue toning. Blends Well With: Basil, bay, black pepper, cardamom, cedarwood, chamomile roman, clary sage, coriander, cypress, eucalyptus citriodora, eucalyptus radiata, frankincense, geranium, ginger, grapefruit, juniper, marjoram, orange, palmarosa, patchouli, petitgrain, rosemary, sandalwood, tea tree, thyme linalol, vetiver, and ylang ylang. 037 Mandarin essential oil $17/oz. Traditional Use: Used in soaps, cosmetics, and perfumes, especially colognes. Properties: Its properties resemble those of chamomile more than other citrus oils. Antiseptic, antispasmodic, calmative, carminative, digestive, diuretic (mild), hypnotic, laxative (mild), sedative, stimulant (digestive and lymphatic), and tonic. Blends Well With: Basil, black pepper, roman chamomile, cinnamon, clary sage, clove, frankincense, geranium, grapefruit, jasmine, juniper, lemon, myrrh, neroli, nutmeg, palmarosa, patchouli, petitgrain, rose, sandalwood, and ylang ylang. Safety Data: Non-toxic, non-irritant, and non-sensitizing. Possibly photo toxic, although it has not been demonstrated decisively. 038 Sweet Marjoram essential oil $23/oz. The herb has a long tradition in culinary use and as a 'folk' remedy. It was used by the ancient Greeks in fragrances, cosmetics and medicines. It's original name comes from a greek word meaning 'joy of the mountains'. It was planted on graves to bring spiritual peace to the departed. It has been used in unguents and perfumes since records are known. Traditional Use: Used as fragrance components in soaps, detergents, cosmetics, and perfumes. Employed in most major food categories, especially meats, seasonings and sauces, as well as soft drinks and alcoholic beverages. Properties: Analgesic, anti-aphrodisiac, antioxidant, antiseptic, antispasmodic, antitussive, antiviral, bactericidal, calmative, carminative, cephalic, diaphoretic, digestive, diuretic (mild), emmenagogue, expectorant, hypotenser, laxative, nervine, sedative, tonic, vasodilator, and vulnerary. Benefits: Amenorrhea, anxiety, bronchitis, bruises, chilblains, colds, constipation, coughs, dysmenorrhea, dyspepsia, epileptic seizures, flatulence, grief, headache, head congestion, hypertension, hysteria, insomnia, leucorrhea, lumbago, muscular aches and stiffness, neurasthenia, PMT, sore throats, strains, ticks, and vertigo. Blends Well With: Basil, bergamot, black pepper, cedarwood, roman chamomile, cypress, eucalyptus citriodora, eucalyptus radiata, fennel, juniper, lavender, lemon, lime, mandarin, nutmeg, orange, peppermint, pine, rosemary, tea tree, and ylang ylang. 039 Melissa essential oil $452/oz. The word 'Melissa' is Greek for 'Honey Bee', Melissa having been planted near bee hives to produce the most delicious honey. Melissa (or Lemon Balm) oil is considered one of the most powerfully medicinal essential oils in all of aromatherapy, with a wonderfully pleasant sweet, herbaceous aroma. A great deal of oil sold as Melissa today is actually a blend including lemongrass and citronella oils - 'true' Melissa oil has its own unique aroma and properties. Melissa's high cost is a result of needing around 11,000 lbs. of plant material to produce 1 pound of essential oil. The resulting oil from this sweet-smelling herb is a pale yellow liquid with a light, fresh lemony aroma. Melissa oil offered at exceptionally low prices is likely to be adulterated in some way, and will not have the medicinal properties of the true essential oil. Melissa was one of the earliest medicinal herbs. Paracelsus called Melissa the 'elixir of life'. The herb was associated particularly with nervous disorders, the heart, and emotions. Melissa was used for anxiety, melancholy, and to strengthen and revive the vital spirit. In Advanced Aromatherapy, Kurt Schnaubelt wrote "The way in which melissa oil combines an excellent antiviral component with a soothing but pervasive sedative power is difficult to imagine; it has to be experienced. In its complexity, power, and gentleness, melissa oil perfectly illustrates how nature time after time works better than one-dimensional synthetic medicines." Melissa is a strong antiviral – and at the same time, Melissa is very gentle on the emotions, and can bring out this quality in a individual. Melissa oil is calming and uplifting, may relieve headaches, and may help balance the emotions. It may help release emotional blocks and lead to an improved outlook on life. Traditional Use: Used extensively as a fragrance component in toiletries, cosmetics, and perfumes. Properties: Antibiotic, antidepressant, antihistaminic, anti-inflammatory, antiseptic, antispasmodic, antiviral, bactericidal, calmative, carminative, cordial, diaphoretic, digestive, emmenagogue, febrifuge, hypnotic, hypotensive, nervine, sedative, stimulant, stomachic, sudoforic, tonic, uterine, and vermifuge. Benefits: Allergies, amenorrhea, anxiety, asthma, bronchitis, calming, chronic coughs, colds, colic, depression, dysentery, eczema, fever, general tonic, headache, herpes, hypertension, hysteria, indigestion, infertility, insomnia, insect bites, intellectual fatigue, irritability, menstrual pain, migraine, nausea, nervous tension, palpitations, shock, sterility (women), stomach cramps, stress, vertigo, and vomiting. Recipe: For herpes outbreaks, try 1 part Geranium Oil, 1 part Melissa Oil, 1 part Lavender Oil, 10 parts Tea Tree Oil - apply to affected area undiluted 3 times a day; once skin dries and tightens, add mixture to 9 parts Almond Oil. Blends Well With: Chamomile roman, frankincense, geranium, lavender, neroli, petitgrain, rose, and citrus oils. Safety Data: Non-toxic, possible sensitization and dermal irritation; use in low dilutions only. Avoid in pregnancy. 041 Myrrh essential oil $74/oz. Myrrh essential oil (Commiphora myrrha) is produced from resin extracted from the Myrrh tree (or shrub) found in the Middle East. The trunk of the Myrrh tree yields a natural oleoresin when pierced, and the pale yellow liquid hardens into reddish-brown drops known as Myrrh (the tree remains healthy after harvest). The oil is a pale yellow/amber oily liquid with a warm, sweet-balsamic, slightly spicy-medicinal scent. As an ancient 'esoteric' magical herb, Myrrh is said to bridge Heaven and Earth, strengthening the connection between our crown and base chakras. This may allow the manifestation of dreams into this earthly realm. As a 'Funeral' herb, Myrrh is said to ease grief and heal emotional wounds, bringing peace and calm. It's extraction from the solitary tree in the desert represents strength in harsh conditions. Not only was myrrh present at the birth of Christ – as one of the Magi’s three gifts – but at his death as well. Myrrh is thought to have been one of the materials used by the Queen of Sheba in her seduction of King Solomon. Myrrh's first medicinal use was documented some 3700 years ago. Myrrh essential oil is highly prized for it's healing and spiritual powers; the oil has one of the highest sesquiterpene contents - a compound which can directly affect the hypothalamus, pituitary and amygdaline. Myrrh oil alone, or in combination with sandalwood and frankincense can be used to anoint the 'third eye' as a meditation or yoga aid. The aroma of Myrrh essential can be uplifting and assist in spiritual opening - like frankincense oil, myrrh's effect on the central nervous system is a gentle and calming one, able to instill a deep tranquility of the mind. Traditional Use: Used in pharmaceutical products, including mouthwashes, gargles, and toothpaste; also used in dentistry. Extensively used as fixatives and fragrance components in soaps, detergents, cosmetics, and perfumes, especially oriental types and heavy florals. Properties: Anticatarrhal, antifungal, anti-inflammatory, antimicrobial, antiphlogistic, antiseptic, antispasmodic, antiviral, astringent, balsamic, carminative, cicatrisant, emmenagogue, expectorant, fungicidal, pectoral, sedative, stimulant (especially pulmonary), stomachic, tonic, uterine, and vulnerary. Blends Well With: Bergamot, chamomile roman, clove, cypress, eucalyptus citriodora, eucalyptus radiata, frankincense, geranium, ginger, grapefruit, jasmine, juniper, lavender, lemon, mimosa, neroli, palmarosa, patchouli, pine, rose, rosemary, sandalwood, tea tree, vetiver, ylang ylang and all spice oils. Recipe: For mouth sores, try 10 drops myrrh oil, 10 drops of tea tree oil, 10 drops of peppermint oil; add 8 drops of this blend to 4 ounces of warm water and rinse mouth 3 times a day. Safety Data: Non-irritant, non-sensitizing, possibly toxic in high concentration. Its use while pregnant is not recommended. Not for internal use. 042 Neroli essential oil $425/oz. In common with rose and jasmine, neroli oil, Citrus aurantium amara, is a very precious oil and almost a complete fragrance in itself. It forms the heart (along with bergamot, lavender, lemon, petitgrain and rosemary) of one of the world’s most enduring perfumes, ‘Eau de Cologne’. Named for a 17th century Italian princess (Anna Maria, Princess of Nerola, near Rome) who wore the flower as a perfume, the prostitutes of Madrid also employed Neroli as a scent, so they would be recognized by its aroma. The blossoms are worn as a bridal headdress and carried as a bouquet, symbolizing purity and virginity. Although neroli oil is produced in many countries, especially around the Mediteranean area, the oils produced in France and Tunisia have always been considered to be the very finest and still command the highest price. Unlike much of its French counterpart, Tunisian bitter orange trees are not subjected to agrochemicals and much of the neroli essential oil exported from Tunisia is produced from the blossoms of trees grown by small growing co-operatives and families, rather than from large-scale cultivation farms. The essential oil is both a sedative and overall tonic to the nervous system. It can be beneficial for most disorders of an emotional origin. The oil has been used to treat heart palpitations, relieve insomnia and reduce nervousness. Neroli's calming effect can be experienced by deeply inhaling the aroma, and rubbing a few drops on the solar plexus. It takes 1,000 pounds of blossoms to make 1 pound of oil. Traditional Use: Is used in eau-de-cologne and toilet waters (traditionally with lavender, lemon, rosemary, and bergamot). Properties: Antibiotic, antidepressant, antiseptic, antispasmodic, aphrodisiac, bactericidal, calmative, carminative, cicatrisant, cordial, cytophylactic, deodorant, digestive, fungicidal, hypnotic (mild), neurotonic, sedative, stimulant (nervous), and tonic. Benefits: Anxiety, birthing, colic, convalescence, diarrhea (chronic), fatigue, flatulence, hemorrhoids, hysteria, insomnia, intestinal spasm, mature and sensitive skin, nervous depression, nervous dyspepsia, nervous skin rashes, nervous tension, oily and dry skin, palpitations, PMS, PMT, poor circulation, scars, shock, skin care, stretch marks, thread veins, tuberculosis, uplifting, and wrinkles. Blends Well With: Benzoin, German and Roman chamomile, clary sage, coriander, frankincense, geranium, ginger, grapefruit, jasmine, juniper, lavender, lemon, lime, mandarin, myrrh, orange, palmarosa, petitgrain, rose, sandalwood and ylang ylang. Safety Data: Non-toxic, non-irritant, non-sensitizing, and non-photo toxic. 044 Nutmeg, Extra essential oil $16/oz. Traditional Use: Used as a flavoring agent in pharmaceuticals, especially analgesic and tonic preparations. It is also used in soaps, lotions, detergents, cosmetics, and perfumes. Properties: Analgesic, antioxidant, antirheumatic, antiseptic, antispasmodic, aphrodisiac, carminative, emmenagogue, larvicidal, neurotonic, stimulant, and tonic. Benefits: Arthritis, bacterial infection, diarrhea, flatulence, frigidity, gout, impotence, indigestion, muscular aches and pains, nausea, nervous fatigue, neuralgia, poor circulation, rheumatism, and sluggish digestion. Many think that inhaling the fragrance of nutmeg is said to open the conscious mind to attract financial prosperity. Blends Well With: Bay, black pepper, clary sage, coriander, eucalyptus, geranium, ginger, lavandin, lime, mandarin, oakmoss, orange, peru balsam, petitgrain, rosemary, ylang ylang and most spice oils. Safety Data: Generally non-toxic, non-irritant, and non-sensitizing. However, used in large doses they show signs of toxicity such as nausea, stupor and tachycardia, believed to be due to the myristicin content. Use extreme caution when administering internally. Its use while pregnant is not recommended. 045 Orange essential oil $11/oz. Traditional Use: Extensively used as a fragrance component in soaps, detergents, cosmetics, perfumes, and in the food and drinks industry. Properties: Antibiotic, anticoagulant, antidepressant, antigenic, anti-inflammatory, antiseptic, antispasmodic, bactericidal, calmative, carminative, cholagogue, choleretic, depurative, digestive, diuretic, fungicidal, humectant, hypotensive, sedative (nervous), stimulant (digestive and lymphatic), stomachic, and tonic. Blends Well With: Bay, bergamot, black pepper, cinnamon, clary sage, clove, coriander, eucalyptus citriodora, frankincense, geranium, ginger, grapefruit, jasmine, juniper, lavender, lemon, lime, litsea cubeba, marjoram, myrrh, neroli, nutmeg, patchouli, petitgrain, rose, sandalwood, vetiver, and ylang ylang. Safety Data: Generally non-toxic, non-irritant, and non-sensitizing, although caution must be used when applying it to the skin. 046 Oregano essential oil $29/oz. Traditional Use: Used as a fragrance component in soaps, colognes and perfumes, especially men’s fragrances. Properties: Analgesic, anthelminthic, antirheumatic, antiseptic, antispasmodic, antitoxic, antiviral, bactericidal, carminative, choleretic, cytophylactic, diaphoretic, diuretic, emmenagogue, expectorant, febrifuge, fungicidal, parasiticide, rubefacient, stimulant, and tonic. One of the strongest antibacterial essential oils. Blends Well With: Bay, bergamot, camphor, cedarwood, chamomile roman, citronella, cypress, eucalyptus (all), lavandin, lavender, lemon, lime, litsea cubeba, mandarin, oakmoss, orange, petitgrain, pine, rosemary, spike lavender, tea tree, thyme linalol, and thyme red. Safety Data: Dermal toxin, skin irritant, mucous membrane irritant. Avoid during pregnancy and not to be used on children under 18. Do not use in baths. 047 Palmarosa essential oil $11/oz. Palmarosa oil (Cymbopogon martinii) has been distilled since the 18th century. Featured in the Indian Materia Medica, the oil and the dried herb are both used in Ayurvedic medicine. Traditional Use: Used extensively as a fragrance component in cosmetics, perfumes, and especially soaps due to excellent tenacity. Used for the isolation of natural geraniol. Properties: Antibacterial, antibiotic, antifungal, anti-infectious, antiseptic, antiviral, cicatrisant, cytophylactic, digestive, emollient, febrifuge, nervine, stimulant (digestive, circulatory), tonic (heart), and vermifuge. Benefits: Acne, anorexia, athlete’s foot and other fungal infections, bronchitis, convalescence, cryptococcus, dermatitis, digestive atonia, eczema, general fatigue, intestinal infections, mature skin, nervous exhaustion and stress related conditions, regeneration of the skin, regulates oil production of the skin, scar tissue, skin infections, tissue regeneration, uterine tonic, vaginal infections, and wrinkles. Blends Well With: Amyris, bay, bergamot, cananga, cedarwood, roman chamomile, citronella, clary sage, clove, coriander, frankincense, geranium, ginger, grapefruit, guaiacwood, juniper, lavender, lemon, lemongrass, lime, mandarin, neroli, oakmoss, orange, patchouli, petitgrain, rose, rosemary, rosewood, sandalwood, and ylang ylang. 048 Parsley Seed essential oil $29/oz. Traditional Use: Used in some carminative and digestive remedies, such as ‘gripe waters’. It is used in soaps, detergents, colognes, cosmetics and perfumes, especially men’s fragrances. It is also found in meats, pickles, and sauces. Properties: Antimicrobial, antirheumatic, antiseptic, astringent, carminative, depurative, diuretic, emmenagogue, febrifuge, hypotensive, laxative, stimulant (mild), stomachic, and tonic (uterine). Benefits: Accumulation of toxins, aids in child birthing, amenorrhea, arthritis, broken blood vessels, cellulite, colic, cystitis, dysmenorrhea, flatulence, hemorrhoids, indigestion, rheumatism, sciatica, and urinary infection. Blends Well With: Cananga, clary sage, neroli, oakmoss, rose, tea tree, and spice oils. Safety Data: Moderately toxic and irritating to some individuals, otherwise non-sensitizing. Use in moderation and avoid during pregnancy. Not for internal use. 051 Peppermint essential oil $22/oz. Peppermint oil (Mentha piperita) is considered by aromatherapists as one of the more indispensable essential oils, standard in one’s first aid kit. It is known as one of the seven polyvalents (effective against many toxins), which are applicable to many ailments. According to Greek mythology the genus Mentha takes its name from the nymph Minthe who was seduced by Pluto and turned into a plant by his jealous wife, who trod Minthe into the ground. Pluto, however, turned her into an herb, knowing people would then appreciate Minthe for years to come. Traditionally classified as a Visionary Herb, mint was thought not only to uplift the Spirit, but also to bring dreams of prophecy. Mint was dedicated to the Ancient Greeks to Zeus, the king of the gods. Traditional Use: Flavoring agent in pharmaceuticals, and ingredient in cough, cold and digestive remedies. Is also used as a flavoring agent in many foods, especially chewing gum and confectionery, alcoholic and soft drinks; also tobacco. Fragrance components in soaps, toothpaste, detergents, cosmetics, and perfumes. Properties: Analgesic, anesthetic (mild), antibiotic, antidepressant, anti-infectious, anti-inflammatory, antimicrobial, antiparasitic, antiphlogistic, antipruritic, antiseptic, antispasmodic, astringent, carminative, cephalic, cholagogue, cordial, decongestant for the prostate (mild), depurative, digestive, emmenagogue, expectorant, febrifuge, hepatic, sedative, stimulant (particularly to the heart, brain, and pancreas), stomachic, sudorific, tonic (nerve), vasoconstrictor, vermifuge, and viricide. Benefits: Acne, asthma, belching, bronchitis, cholera, clears the sinuses, colds, cough, cramps, dermatitis, diarrhea, dysmenorrhea, dyspepsia, eczema, fainting, fevers, flatulence, flu, gaseous indigestion and irritated colon, gastralgia, halitosis, headaches, hysteria, insect bites, insufficient liver or pancreas juices, kidney stones and gallstones, mental fatigue, migraine, motion sickness, mouth or gum infections, muscular pain, nausea, nerve pain, nervous disorders, neuralgia, palpitations, paralysis, poor circulation, pruritis, purulent (itching, stinking), respiratory disorders, ringworm, scabies, sciatica, shock, sinusitis, toothache, travel sickness, tuberculosis, vertigo, and vomiting. Blends Well With: Basil, benzoin, black pepper, cedarwood, cypress, eucalyptus (all), geranium, grapefruit, juniper, lavender, lemon, lime, marjoram, niaouli, pine, ravensara, rosemary, thyme, tea tree, and other mints. Safety Data: Non-toxic, non-irritant (except in concentration), possible sensitization due to menthol. Use in moderation. Not recommended for us while pregnant. 053 Rose Otto essential oil $803/oz. Rose Otto (Rosa damascena) is the queen of roses, the queen of flowers and the queen of all essential oils. Its fragrant blooms have long been prized as a symbol of love and beauty and it holds a special place in the hearts of all who love aromatherapy and natural perfumery. There is quite simply, no other essential oil quite like it in terms of fragrance and wealth of therapeutic healing benefits. Even with her prohibitive price and the advent of organic synthesis, rose otto is still the most widely used essential oil in perfumery. Of the very few of the world’s 7,000 rose varieties that produce oils, the Bulgarian Damask Rose, cultivated for over 300 years, is considered to be the most desirable. It is the predominant anointing oil used in the coronation ceremony of British monarchs. Thought to originate in Damascus, Rosa damascena, was brought to Southern France in the 14th century by knights returning from the Crusades. Various strains of roses, including damask rose, were cultivated and used in the ancient Greek, Roman, Asian, Egyptian, and Arab worlds. It is mentioned by Homer in the Iliad. Avicenna, a Persian physician, was the first to produce rose water in the 1st century CE. In 77 CE, Pliny the Elder recorded 32 different beneficial effects of rose preparations. Damask rose preparations are used in Ayurveda, ancient and traditional Indian medicine, for soothing various complaints. The origin of the cultivated rose is believed to be the Gulf of Persia (now Iran) in the 10th through 17th centuries. The first known rose oil distilleries existed in the year 1612 in Shiraz, the famous city of poets and oriental culture. From here the rose industry spread into Arabia, Mesopotamia, Palestine, Asia Minor (Anatolia) Greece, India, North Africa, and due to the conquering Moors reached as far as Spain. To this day, of all the places in the world where roses are cultivated, there are just a handful of regions in two countries (Bulgaria & Turkey) that provide just the right conditions to grow this incredible flower in large enough quantities to produce rose otto essential oil on a large scale. Unique climactic and soil conditions make Bulgaria’s Valley of the Roses the finest rose oil producing region in the world. It is also known as the Kazanlik Valley. Kazan is the Turkish word for 'still', and Kazanlik literally means 'the place of stills'. The air humidity, cloudiness and precipitation in May and June here contribute to the cultivation of roses that do not over produce wax for protection from the rays of the sun, thus yielding the highest percentage of oil. The harvesting season starts as soon as the flowers begin to open and continues until all the roses have been gathered. In Bulgaria the blossoms are still collected by hand and are nipped just below the calyx (the green, outer protective cover). Collection begins at sunrise when the oil yield is at its highest, and is completed by 10am whilst the dew is still on the flowers. The flowers are initially placed into baskets, and then transferred to sacks for transportation via horse drawn carriages or the backs of donkeys to the distilleries. drawn carriages or the backs of donkeys to the distilleries. It takes about 4,000 pounds of flowers to make 1 pound of rose oil; that’s approximately 60,000 roses to produce just 1 oz of Rose Oil (Rose Otto) or about 2-1/2 dozen roses to make just one drop. NOTE: Distilled Rose Otto at it's undiluted, 100% strength naturally crystallizes and congeals, in fact these characteristics are indications of quality in the distilled product. It liquifies readily with warmth of hands or warmer room temperatures. Traditional Use: Employed extensively in soaps, cosmetics, toiletries, and perfumes of all types. Properties: Antidepressant, anti-infectious, antiphlogistic, antiseptic, antitubercular agent, antiviral, aphrodisiac, astringent, bactericidal, choleretic, cicatrisant, cytophylactic, depurative, emmenagogue, emollient, hemostatic, hepatic, laxative, pectoral, regulator of appetite, sedative (nervous), stomachic, and tonic (heart, liver, stomach, uterus). Benefits: Amenorrhea, aphrodisiac, asthma, broken capillaries, childbirth, cholecystitis, coughs, depression, dry skin, eczema, emotional crisis, general tonic, frigidity, hay fever, headache, herpes, impotence, infertility, insomnia, leucorrhea, liver congestion, mature and sensitive complexions, menorrhagia, nausea, nervous tension and stress-related complaints, palpitations, poor circulation, scarring, skin problems, uterine disorders, and wrinkles. Blends Well With: It blends well with most oils and is useful for ‘rounding off’ blends. Particularly, it works well with bergamot, chamomile roman, clary sage, geranium, jasmine, lavender, lemon, mandarin, melissa, neroli, patchouli, petitgrain, rosewood, sandalwood, ylang ylang, and vetiver. Safety Data: Non-toxic, non-irritant, and non-sensitizing. There are rare reports of allergy or dermatitis in hypersensitive individuals. Its use while pregnant is not recommended. 055 Rosewood essential oil $22/oz. Traditional Use: Once used extensively as a source of natural linalol, now increasingly replaced by the synthetic from. Used extensively in perfumery work, soaps, toiletries, cosmetics, and perfumes. Properties: Analgesic (mild), antibacterial, anticonvulsant, antidepressant, antifungal, anti-infectious, anti-microbial, antiseptic, aphrodisiac, cephalic, deodorant, stimulant (immune system), and tonic. Benefits: Acne, colds, coughs, dermatitis, fever, frigidity, headaches, infections, nausea, nervous tension and stress-related conditions, respiratory infections, scars, skin (sensitive, dry, dull, combination oily/dry), stimulates the immune system, vaginal candida, wounds, and wrinkles. Blends Well With: Blends well with most oils, especially citrus, woods, and florals. It helps give body and rounds off sharp edges. 057 Sandalwood Tamil Nadu essential oil $254/oz. Sandalwood (Santalum album) has been coveted in India and Asia since the dawn of history. It is mentioned in the oldest scriptures and the Vedas, which date back many thousands of years. The heartwood of this tree is sought after for its marvelous, cedar-like scent. Even after cutting, the wood will exude this pleasant odor for up to 60 years. In fact, sandalwood oil distilled from the wood and seeds is used for cosmetics, medicines, perfumes and lubricants. Ancient civilizations considered sandalwood a valuable commodity, along with gold, silver, amber and ivory. Explorers such as Marco Poco returned to their homelands with fabulous tales of sandalwood, teak, spices and jewels. So great was the demand for this valuable wood, especially for people of great wealth and royalty, that King Solomon himself was a major factor in the extermination of Lebanon's sandalwood forests centuries ago. In fact, there are no untouched sandalwood forest left in the world today. The divinely sweet aroma, a softly balsamic base-note, evokes the Earth element at its most sensual yet deeply tranquil. Sandalwood Tamil Nadu is a very smooth sandalwood, best used for its therapeutic, rather than strictly aromatic properties. Sandalwood retains an important place in Ayurvedic, Tibetan, and traditional Chinese medicines. The oil is high in sesquiterpenes, a class of compound which has been studied in Europe for its stimulating of the pineal gland and the limbic region of the brain - the center of our emotions. Clarifying and stilling to the mind, and refreshing to an overheated body, Sandalwood is thought to reconnect one to the primordial state of being, diminishing the need to 'overthink'. Sandalwood can instill a sense of inner unity, helping re-establish an acceptance of reality as it is. Yogis believe it encourages a meditative state and enhances devotion to God. Traditional Use: Extensively employed as a fragrance component and fixative in soaps, detergents, cosmetics, and perfumes – especially oriental, woody, aftershaves, and chypres. Properties: Antidepressant, anti-infectious, antiphlogistic, antiseptic (urinary and pulmonary), antispasmodic, aphrodisiac, astringent, bactericidal, calmative, carminative, cicatrisant, decongestant (lymph and veinous system), diuretic, emollient, expectorant, fungicidal, insecticidal, sedative, and tonic (heart). Blends Well With: Basil, bergamot, black pepper, cassie, chamomile roman, clary sage, clove, costus, eucalyptus, geranium, grapefruit, fennel, frankincense, jasmine, labdanum, lavender, lemon, mandarin, mimosa, myrrh, neroli, oakmoss, orange, palmarosa, patchouli, pine, peppermint, rose, rosewood, tuberose, vetiver, violet, and ylang ylang. 058 Savory Montana essential oil $33/oz. Traditional Use: Occasionally used in perfumery work. Employed to some extent in flavoring, mainly meats and seasonings. Properties: Anticatarrhal, antiputrescent, antispasmodic, aphrodisiac, astringent, bactericidal, carminative, cicatrizant, emmenagogue, expectorant, fungicidal, stimulant, and vermifuge. Benefits: Should not be used on the skin at all. Blends Well With: Lavandin, lavender, oakmoss, pine, rosemary, and citrus oils. Safety Data: Dermal toxin, dermal irritant, and mucous membrane irritant. Avoid during pregnancy. 062 Tea Tree essential oil $11/oz. Because the water-resistant “paperbark” is so easy to peel off the tree, Tea Tree (Melaleuca alternifolia) was used extensively by the aboriginal peoples of Australia to make small canoes, knife sheaths, and thatching for shelters. When cut down, the Tea Tree will quickly regrow from the stump. The aborigines soaked the pungent leaves in hot water and taken them as a cure for cold coughs, and headaches – or they were simply picked from the tree and chewed. It was Captain Cook who called the plant Tea Tree and it was a valued bush remedy used by early European settlers. In World War II cutters and producers of tea tree were exempt from military service until enough essential oil had been accumulated. It was issued to each soldier and sailor for them to treat tropical infections and other problems of warfare, including wounds. Traditional Use: Employed in soaps, toothpastes, deodorants, disinfectants, gargles, germicides, and increasingly, in aftershaves and spicy colognes. Properties: Analgesic, antibacterial, antibiotic, anti-infectious, anti-inflammatory, antiparasitic, antiseptic, antiviral, balsamic, cicatrisant, decongestant, diaphoretic, expectorant, fungicidal, stimulant (immune), and vulnerary. In 1923 an Australian scientist, Dr. A. R. Penfold, conducted a study of tea tree essential oil and discovered it to be 12 times more potent as an antiseptic bactericide than carbolic acid (the standard at the time). Tea Tree oil became recognized, according to the British Medical Journal in 1933, as 'a powerful disinfectant, non-poisonous and non-irritating'. Blends Well With: Tea Tree essential oil has a fresh, sharp scent, and is not usually blended with other oils, however it can blend with basil, bergamot, black pepper, cananga, german chamomile, roman chamomile, clary sage, clove, cypress, eucalyptus globus, eucalyptus radiata, geranium, juniper, lavandin, lavender, lemon, marjoram, nutmeg, oakmoss, oregano, peppermint, pine, ravensara, rosemary, thyme linalol, and thyme red. Safety Data: Non-toxic, non-irritant, with possible sensitization in some individuals. Not to be used internally. 063 Red Thyme essential oil $29/oz. Properties: Analgesic, anthelminthic, antifungal, anti-infectious, antimicrobial, anti-oxidant, antiputrescent, antirheumatic, antiseptic, (intestinal, pulmonary, genito-urinary), antispasmodic, antitussive, antitoxic, antivenomus, antiviral, aperitif, aphrodisiac, astringent, bactericidal, balsamic, carminative, cicatrizant, diuretic, emmenagogue, nervine, parasiticide, pectoral, revulsive, rubefacient, stimulant (immune system, circulation), sudorific, tonic, and vermifuge. Benefits: Abscess, acne, anorexia, arthritis, asthma, balsamic, bronchitis, bruises, burns, catarrh, cellulitis, chills, colds, coughs, cuts, cystitis, dermatitis, diarrhea, dyspepsia, eczema, edema, expectorant, flatulence, flu, gout, gum infections, headaches, infectious diseases, insect bites, insomnia, gum infections, laryngitis, lice, muscular aches and pains, nervous debility and stress related conditions, obesity, oily skin, poor circulation, rheumatism, scabies, sinusitis, sore throat, sports injuries, sprains, thrush, tonsillitis, urethritis, verrucas, and warts. Safety Data: Do not use while pregnant or on children. Can be a mucous membrane and skin irritant. 064 Turmeric essential oil $29/oz. Traditional Use: Employed in perfumery work, for oriental and fantasy-type fragrances. Properties: Analgesic, anti-arthritic, anti-inflammatory, anti-oxidant, bactericidal, cholagogue, digestive, diuretic, hypotensive, insecticidal, laxative, rubefacient, and stimulant. Safety Data: The ketone ‘tumerone’ is moderately toxic and irritant in high concentration. Possible sensitization problems. Not for internal use. 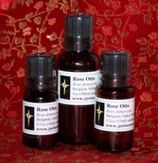 070 Ylang Ylang essential oil $38/oz. Ylang ylang essential oil is distilled from a small tree (Cananga odorata) which grows in Indonesia, the Philippines, Madagascar and Reunion Islands. It means 'flowers of flowers' and you can find pink, mauve and yellow flowered varieties. The best oil comes from the yellow flowers, which are picked very early in the day, in early summer. The fragrant, pale yellow petals are often strewn across the marriage bed as a symbol of love. This sweet, heavy, distinctive fragrance is used widely in perfumes and cosmetics. Ylang ylang oil's softer floral scent is often used in men's fragrances as an alternative to the sweeter and more feminine rose. Like the three major aphrodisiac oils (rose, neroli and jasmine), ylang ylang is beautifully uplifting emotionally and relaxing. The calming effect of this oil may be the reason it is considered an aphrodisiac as using it would lessen tensions or anxieties. It can help balance male and female energies, reducing internal conflict between these seeming opposites. In this manner, the aroma of the oil may positively influence sexual relationships, and help restore confidence. 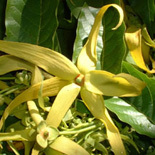 Traditional Use: Extensively used as a fragrance component and fixative in soaps, cosmetics, perfumes; ylang ylang extra tends to be used in high-class perfumes, ylang ylang 3 in soaps, detergents, etc. Properties: Antidepressant, anti-infectious, antiseborrheic, antiseptic, aphrodisiac, calmative, euphoric, hypotensive, nervine, regulator, sedative (nervous), stimulant (circulatory), and tonic. Benefits: Acne, circulation, depression, frigidity, hair growth, high blood pressure, hyperpnoea, hypertension, impotence, insect bites, insomnia, nervous tension, oily skin, palpitations, PMS, regulates cardiac and respiratory rhythms, tachycardia, and uterine tonic. Blends Well With: most oils, including bergamot, cassie, chamomile roman, clary sage, clove, costus, eucalyptus citriodora, ginger, geranium, grapefruit, jasmine, lavender, lemon, litsea cubeba, mandarin, mimosa, neroli, opopanax, orange, palmarosa, patchouli, Peru balsam, petitgrain, rose, rosewood, sandalwood, tuberose, vetiver, and yuzu. Shanti Dechen : What is Aromatherapy? Be an experienced and knowledgeable user of essential oils and research all oils thoroughly and/or consult with a skilled practitioner before any use. Dilute all oils being used with a vegetable carrier oil. Skin test all essential oils before using topically. Each person's body is different, so apply oils to a small area first. The inside of the arm is good for this. The bottoms of the feet are two of the safest, most affective places to use essential oils. Discontinue use or dilute further with vegetable oil if there is discomfort or skin irritation. Keep essential oils out of the reach of children. Treat them as you would any product with therapeutic uses. Take special precaution with babies, pregnant women and anyone and everyone with allergies, special conditions and needs. Keep essential oils away from mucous membranes and the eye area and do not put into ears. Do not handle contact lenses or rub eyes with essential oils on fingers. Know also that many of the citrus oils and others may cause a rash or darker pigmentation if applied to skin exposed to direct sunlight or UV rays within 3 to 4 days of use. Keep bottles of essential oils tightly closed and store them in a cool location away from light. If stored properly, essential oils will maintain their potency for many years.